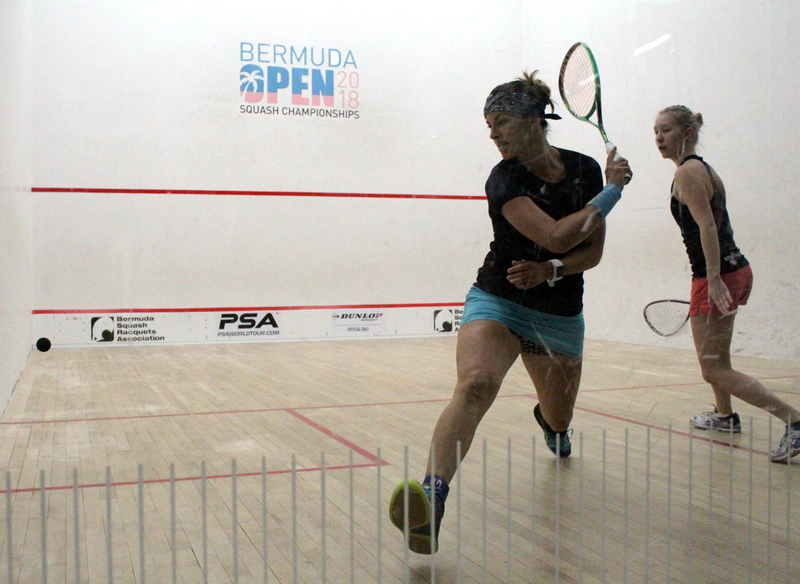 The Semi-Finals of the Bermuda Open Squash Championships kept the large crowd on their toes with excitement. At the end of the night on the Men’s side the English top seeds are through to the final, while South Africa are assured of a Women's title. This match was a hard physical battle peppered by way to many lets! Neither player really figure each other out movement wise resulting in constant clashes and discussion with referee Micah Franklin. In the end Gillams was able to stretch out Graham and find some amazing angles and winners to go through to the final winning 8-11, 11-7, 11-9, 11-6. Murrills started well getting the better of some intense rallies winning the first game 11-9, but Finch levelled with some high quality squash winning 11-8, before somehow Murrills seemed to up the pace again for the 3rd and 4th sets managing to get the best of some well fought rallies closing out the match winning 11-3, 11-6. In an action packed but topsy turvy match, Soini will be kicking herself after having leads of 7-0 in the second and 7-3 in the third and coming away with neither. In the end Milnay was steadier, more controlled and played the big points at the of each game really well winning 12-10, 11-9, 11-9. Fuller got in front early and never really let up. Her speed around the court and continued pressure had Bunyan on the back foot throughout. Each game was close with chances for Bunyan to break through but each time she got close Fuller closed her down, it was a very solid performance from the South African as she advanced winning 11-7, 11-8, 11-6.